ATENŢIE: Produsul Amplificator casti iFi Audio Nano iCAN nu mai este disponibil la AVstore.ro. Acest lucru se datorează de cele mai multe ori faptului că producătorul iFi Audio a încetat să mai fabrice acest model sau l-a înlocuit cu unul mai performant. Completeaza mai jos intrebarile tale referitoare la Amplificator casti iFi Audio Nano iCAN si un consultant AVstore.ro iti va raspunde in cel mai scurt timp posibil. iFi nano iCAN este varianta portabila a amplificatorului de casti din gama "micro" ( functioneaza pe baterie si este de doua ori mai mic decat micro iCAN ). Acest produs se adreseaza celor care doresc sa se bucure de o audite de buna calitate la casti atat in sistemul de acasa cat si pe strada. nano iCAN se preteaza perfect pentru aceasta sarcina - are functiuni multiple, poate accepta semnal atat pe minijack de 3.5 mm cat si pe RCAuri, are o baterie litiu-polimer care ii confera o autonomie excelenta. nano iCAN este conceput in aceeasi filozofie de sunet ca si celelalte produse iFi Audio: sunet natural, rezolut si muzical, cu un bas profund si autoritar. La fel ca si micro iCAN, nano iCAN este ajustabil in functie de gusturi si nevoi. Un sunet excelent, la purtator. Alimentarea din nano iCAN are doua mari beneficii: - ofera portabilitate prin bateria litiu-polimer care tine pana la 70 de ore si livreaza suficient curent astfel incat sa se descurce si cu casti mai dificile. Orice dispozitiv mobil sau telefon iOS sau Android poate fi ajutat prin simpla conectare pe jack de 3.5 mm. nano iCAN este deosebit fiindca utilizeaza tehnologia DirectDrive® - nu se folosesc condensatori de cuplare in etajul de iesire, calea de semnal este optimizata perfect, amplificatorul ofera un damping factor foarte bun, iar sunetul este lipsit de distorsiuni. DirectDrive® este unul din motivele pentru care produsele iFi Audio au primit reviewuri excelente. 3D HolographicSound® a avut un atat de mare succes incat mai multi producatori au inceput sa ofere functii similare pe aparatele lor. 3D HolographicSound® este un circuit conceput de iFi Audio care incearca sa elimine senzatia de "sunet in cap", specifica castilor. Imaginea stereofonica este amplificata mult, iar sunetul este mai aerisit. Diverse tipuri de casti se comporta in mod diferit. XBass® este un circuit special dezvoltat pentru micro iCAN care asigura atingerea unui bas profund si natural, cu autoritate. Acest circuit a fost preluat si pe nano iCAN, imbunatatirile aduse sunetului fiind evidente. Atat XBass cat si 3D HolographicSound sunt circuite realizate in domeniul analogic, fara utilizarea de DSPuri. From what I can tell, the basic amp topology seems to utilize an OPA1642 for gain stage, followed by MAX9722 as buffer. In between them, there are the Xbass and 3D Holographic Sound that I have nothing to say but praise for. As I have said on another review, MAX9722 can go from mediocre to really good, depends on the implementation. iFi has utilized it quite successfully on the micro iDAC, and the new implementation seems to work fairly well on the nano iCAN too. Subjectively speaking, nano iCAN doesn’t quite have the kind of maturity and effortlessness found on JDS Labs C5, but it has no problem matching up to FiiO E12. With E12, you get a sense of tighter control, power and intimacy. With nano iCAN, it is more neutral with better clarity and a really wide soundstage, even before the EQ is turned on. All and all, I won’t categorize nano iCAN as a top-tier portable amp in the sub-$200 price bucket, but it is definitely a very close runner-up. The thing that really makes nano iCAN unique is however its XBass and especially the 3D Holographic Sound EQ. Sometime hardware EQ can be over implemented in portable amps, such as the case of C&C BH, where it helps a lot on some music but also ruins the whole image on others. 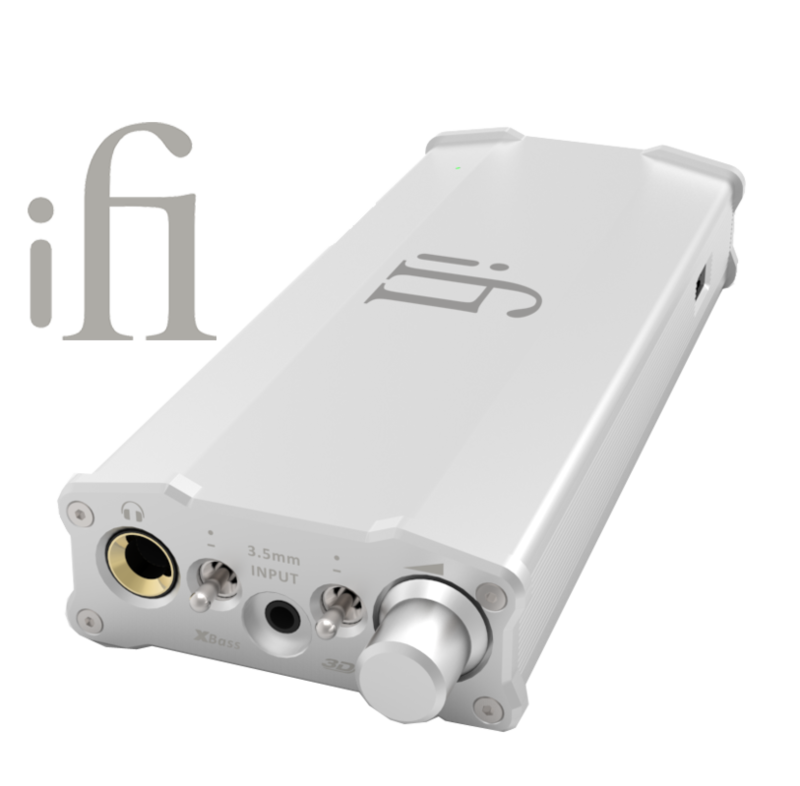 The way iFi does its EQ is much gentler yet remains effective. They do exactly what they are meant to do without making anything sounds artificial or out of place. The degree of refinement is something I haven’t experienced on EQ from another brand of portable amp." "But, the minute I added the Nano iCAN to the signal path, everything got better in a big, big way. Suddenly, the presentation sounded appropriately full-bodied, full of natural and organic weight and warmth, while dynamics became markedly more expressive and, when the music warranted, downright powerful. Candidly, the before/after difference was so great that the LCD-3 almost sounded like a different headphone with the Nano iCAN in play. Does this mean the iDSD has an inadequate or ‘weak’ amplifier? No, not at all. But it does mean the iDSD is fairly particular about the loads it can and can’t drive well. The Nano iCAN’s role, however, is to open up the playing field to help the iDSD (or any other portable source component) drive a much broader spectrum of headphones and earphones. This it does wonderfully well and with such good-natured grace and exuberance, refinement, and sophistication, that you may find yourself wondering how iFi managed to pack so much goodness into such a small case for just £149. Trust us: It’s money well spent." "the iCAN nano has left me wowed by both the refinement, robustness, and sheer “feistiness” of its sound; on first listen, it seems to offer quite a lot more output than its modest 150mW output specification would lead you to expect. If you weren’t able to hold the compact device in the palm of you hand (with room left over) and if you judged it purely on sound quality, you might easily think the iCAN was one of today’s nicer desktop headphone amps. Yes, really. About the only point at which you’ll discern the iCAN’s limitation (and, yes, it does have its limits) will be when you try using the iCAN to drive brutally power-hungry ‘phones such as the HiFiMAN HE-6. Then, things will be fine to a point, but when big dynamic swells or power-slurping heavy-duty bass passages come along you will hear moments when the iCAN nano abruptly and decisively runs out of power and distorts and/or runs into audio clipping. However, use the iCAN nano with headphone loads that fall within its wheelhouse and you’ll be a very happy audiophile indeed." Vezi specificatii tehnice, review-uri si pareri despre Amplificator casti iFi Audio Nano iCAN (ref.29628).